The IoT-500 is a world-class HMI panel engineered to provide the highest level of flexibility and reliability to support your automation and system optimization requirements. Our HMI solutions are based on the Dual Core MTK MT2601 industrial chipset from MediaTek, and feature support for the Android™ v5.1 operating system. The combination of robust processing power, open operating system and a flexible hardware configuration establishes the AMobile IoT product as a leader in the internet of things market. The IoT-500 connectivity features include a LAN port, 2 x USB2.0 ports, 1 RS232 COM port, 1 GSM/GPRS SIM slot, 2-megapixel camera and speaker with built-in MIC. The IoT-500 supports DC power input range from 12V~24V and provides 4 GPIO ports and a CANbus for motor vehicle interface. 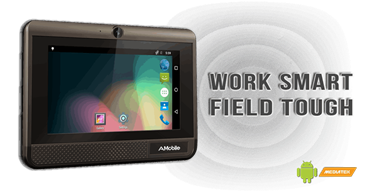 No matter what system you need to control or monitor, the AMobile IoT-500 provides unmatched flexibility and compatibility with commercial equipment, industrial machinery, motor vehicles and complex systems requiring virtualization, remote monitoring, data acquisition and control.